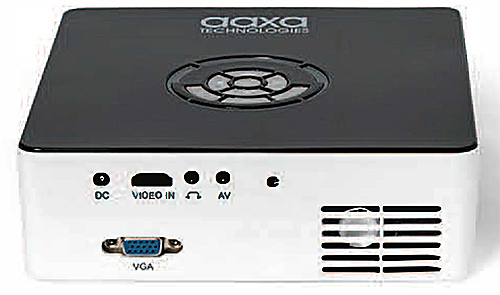 The AAXA M6 Portable Projector delivers a unique combination of portability, 1080p resolution, brightness, and low price. At this writing, there are only two native 1080p projectors on the market that weigh less than three pounds. Between them, the 2.5-pound M6 offers both a higher rated brightness--at 1,200 lumens--and a lower price, at $599. It also has the advantage of a built-in battery, rated at 90 minutes. Add in the 30,000-hour lifetime for the RGB LED light source, and it is a prime candidate for anyone who needs either a battery or AC-powered portable for business or personal use--precisely the niche AAXA is aiming at. Beyond that, the image quality is good enough--despite some issues with color fidelity--to let the M6 serve as an inexpensive alternative to an HDTV or to set up occasionally for a movie in the backyard. In short, the AAXA M6 is strong on versatility and--for now at least--distinctly one-of-a-kind. For documents and graphics--and for animated films--the M6 delivers vibrant color over digital connections like HDMI or from a USB memory key with all of its color mode presets: Presentation, Standard, and Movie. Surprisingly, that's not true with VGA, which is why we recommend using HDMI if possible when using a PC as the source. With VGA, pastel colors turn white in Presentation mode, are pale in Standard mode, and are close to what they should be in Movie mode only. With an HDMI connection to the same graphics card, color is far richer in all three modes than with any mode using VGA. The native 1080p DLP chip enables the M6 to deliver excellent detail. Both black text on white and white text on black are easily readable in Standard mode at sizes as small as 4.5 points. However, the Movie and Presentation modes tend to lose thin lines because of over sharpening. Since the one User mode is the only mode that lets you customize settings, you need to use either it or Standard mode for images with fine detail. For film and video the M6 scores well on contrast ratio, with suitably deep blacks helping to hold shadow detail in dark scenes. Color accuracy is easily good enough for casual viewing in a family room or for a backyard movie night. It's also bright enough for a huge, 135" diagonal image with the nearly-dark level of light in a backyard at night. For a permanent setup in a family room with windows, an 80" image is a workable compromise that gives rich color in moderate ambient light at night and a still watchable, if somewhat washed out, image with daylight streaming through the windows. In a side-by-side comparison to a calibrated projector, colors are a touch oversaturated in all three predefined color modes and even after adjusting color in User mode. Without something to compare to, however, the oversaturation is obvious only in an occasional scene, most often as an oversaturated red in flesh tones. There is no single predefined color mode or set of adjustments we could find that keeps colors within a realistic range for all scenes in all types of source material. But for each individual film and TV show we tested, we were able to find a mode that would keep colors within a realistic range for all scenes with that particular material. Two of the three color presets offer sufficiently accurate color for the entirety of at least some films or TV shows, and it wasn't hard to adjust User mode for realistic color with the remaining material we tested with. As a point of reference, we watched an entire Game of Thrones episode without seeing any obvious color inaccuracies. It is possible that some source material will result in inaccurate color regardless of the color mode or customized settings, but based on our testing, if you see inaccurate color when you start a film or TV show, you can switch to a different color mode that solves the problem. For example, you might watch a film in Standard mode, then switch to User mode for better color accuracy when watching a late night talk show. Brightness. AAXA rates the M6 at 1,200 "LED Lumens," which is the company's way of saying that a meter will measure it as lower, but the human eye will see it as matching a 1,200-lumen lamp-based model. This equivalent brightness claim is based on the observation that colors produced by LEDs are perceived as brighter than colors from lamp-based projectors with the same measured brightness. We measured the brightness with AC power at 693 ANSI lumens and 743 lumens based on a center spot reading. As with virtually any projector, the center spot is the brightest part of the image, so it gives a higher lumen rating than the ANSI measurement, which averages the readings at nine points. We also saw a minor difference in brightness for Movie mode between HDMI input and VGA input, even though the other two modes matched with both inputs. The measured ANSI lumens for each predefined color mode is as follows for Bright, Standard, and Eco lamp modes. With battery power, which AAXA rates at 500 LED lumens, the only lamp option is Eco, and the measured ANSI lumens are the same as with Eco mode using AC power. Low Lamp Modes. Compared with Bright mode, Standard mode is 91% as bright and Eco mode is 44% as bright. Presentation Optimized Lumens. Except for Movie mode with an HDMI connection, brightness is just short of 700 ANSI lumens in each mode, with Standard doing the best job of holding fine detail. By the usual rule-of-thumb recommendations, that would be bright enough for a 75" diagonal image in moderate ambient light, but we found it bright enough to throw an image with rich color even with a 90" diagonal. Video Optimized Lumens. Brightness considerations for video are the same as for presentations, with 700 ANSI lumens the only real choice. The lower brightness Movie mode with HDMI is best avoided, since it shows oversaturated color more often than any of the other modes. Zoom Lens Effect. As is typical for models in this weight class, there's no optical zoom lens and no telephoto setting to curtail light. Brightness uniformity. We measured the brightness uniformity at an unusually high 88%. Fan noise. The M6's fan noise ranges from nearly silent to hard to ignore. In Eco mode, you can't hear it from two feet away. In Standard mode, it's easy to hear from 10 feet, and has a raspy quality that some will find intrusive. In Bright mode, it adds a subtle high whine and is hard to ignore from 15 feet. Most people will want to avoid Bright mode, and anyone who is particularly annoyed by fan noise will want to stay with Eco mode. There is no high altitude mode. Input Lag. The measured lag ranges from 35 ms in Presentation mode to 42 ms in Standard mode. Lamp Life. The rated life for the RGB LED light source is 30,000 hours, based on Eco mode. Warranty. The price includes a 1-year warranty for the projector and light source. At only 2.5 pounds and 2.1" x 7" x 7" (HWD) the M6 is easy to carry, with or without the included soft carrying case. Setup is typical for models in this weight class. In particular, there's no zoom, so you have to move the projector to adjust image size, and getting the focus just right is a little tricky thanks to a thumbwheel control that changes focus a lot with very little movement. Somewhat surprisingly, there's no keystone correction. If you have to tilt the M6 up or down, you just have to live with the geometric distortion. The throw distance for an 80" 16:9 image is 6.4 feet. You can use the AAXA M6 Projection Calculator to find the distance for the image size you want. The vertical lens offset puts the bottom edge of the image a little less than 10% of the image height below the centerline of the lens. Sound. The built-in 2W speaker offers good enough sound quality to be useful, with enough volume for a small conference room or a temporary setup for watching a film or video in a small room. If you want to use the M6 for a movie night or an HDTV replacement, plan on connecting an external sound system. No Keystone Adjustment. 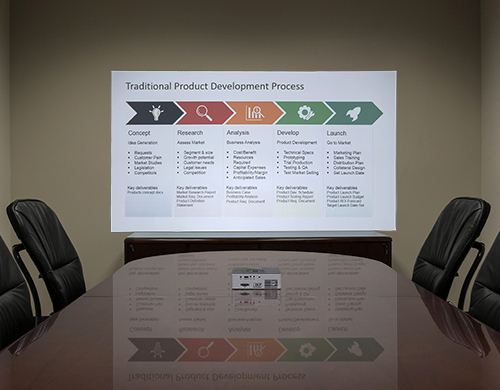 The lack of a keystone adjustment limits the flexibility for positioning the projector relative to the screen without significant geometric distortion. No Zoom. The lack of a zoom is typical for models that weigh this little, but it means you have no flexibility for how far you can place the projector from a given size screen. High Fan Noise. Fan noise in Bright mode is louder than typical for this size projector and distracting enough to limit many people to using the lower brightness modes. 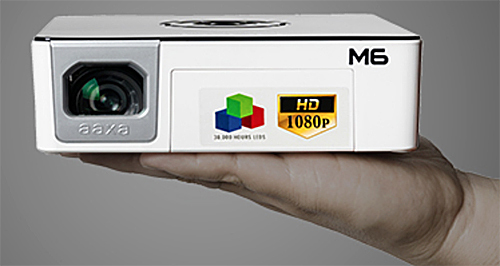 The AAXA M6 Portable Projector delivers a unique mix of native HD 1080p resolution, a 2.5-pound weight for easy portability, and a low price at only $599. It is meant primarily for portable presentation use, but can also serve nicely as a budget-priced home-theater projector, an HDTV replacement, or for ad hoc home use in any room or for a backyard movie night. Set it up for an 80" image in a family room, and it can both stand up to daylight with a slightly washed out image and give vibrant color at night in moderate ambient light. In a dark room, it's bright enough for a huge image, up to 135" diagonal. The fan noise in Bright mode and lack of a keystone adjustment will be an issue for some, but even taking that into account, the AAXA M6 earns a high score for versatility and is a stellar bargain at $599. This projector has a serious color problem in that the red is too high and can not be corrected by any settings. In some scenes normal lips will glow red as if the brightest lipstick is on, and normal men will look like they have the make up of street prostitues. This persists through all color modes and settings. There may be something to the idea that the overly red issue may depend on the source. I can get rid of the red with HBO movies on fios, but can't find a setting to get rid of it with discs on my bluray player. Hi Ron. My predecessor Evan Powell discussed in an article a while ago the issues with attempting to measure true checkerboard ANSI contrast with any projector -- short of a dedicated 100% dark light cave in which to recreate a true blackout condition you can't rely on anything even remotely characteristics of consistent results. And I could argue that even ANSI fails to properly recreate meaningful results that mimic typical viewing conditions. And as for any numbers claimed by a manufacturer for contrast ratio -- whether full on/off or native/dynamic...take it with a grain of salt. These figures are really only useful for comparing one model from another in a particular manufacturer's line-up.